A lot of crazy stuff has been developed for the iPhone. Apple’s Jesus phone has elicited a level of reverence for it that people want to extend its capabilities beyond the boundaries that was originally set by Apple. For example, who would think of turning the iPhone into a DSLR? Apparently, one person did and he was able to turn that idea into reality. Some enterprising blokes have been able to make an iPhone case that has an adapter attached to it where you can attach a Canon EOS or Nikon SLR lens to enable to iPhone to take pictures just like a DSLR – this means you get really strong depth of field and true manual focusing. Other manufacturers have developed apps for the iPhone that have been designed to allow users to “focus” on their subjects and give different kinds of filters. But these are really very weak solutions, at best. Nothing beats having an actual DSLR lens to use and with this nifty case, you won’t even need to buy a camera body anymore, you just need to get the DSLR lenses and use the iPhone as the camera body. The adapter on the iPhone case can carry all types of lenses – from telephoto, to macro, to wide angle – the adapter will accept all kinds of lenses. 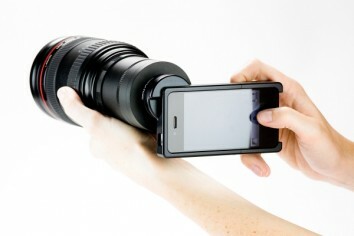 If you can attach it to your DSLR, then you can attach it to case. The case also has built in loopholes so you can put in a camera strap and be able to hang the whole thing around your neck – which pushes the whole DSLR illusion more. With this kind of cool case, you won’t need a dedicated DSLR anymore. As a note, the case will accept all kinds of Nikon lenses, but it will only accept Canon EOS lenses because it only has the EF-Mount adapter.